Mushrooms MUST be my favourite food! I love them in my soups, salads, sandwiches, mains in any cooking method or even eaten raw! Since young, I always seems to be inseparable from mushroom soup, it was a MUST-ORDER food for me whenever it was available on restaurant’s menu. I simply love it. As I get more into healthy eating and cooking my own food, I explored more recipes which I could whipped at home instead of purchasing off-shelves mostly, heavily sodium and preservatives loaded. 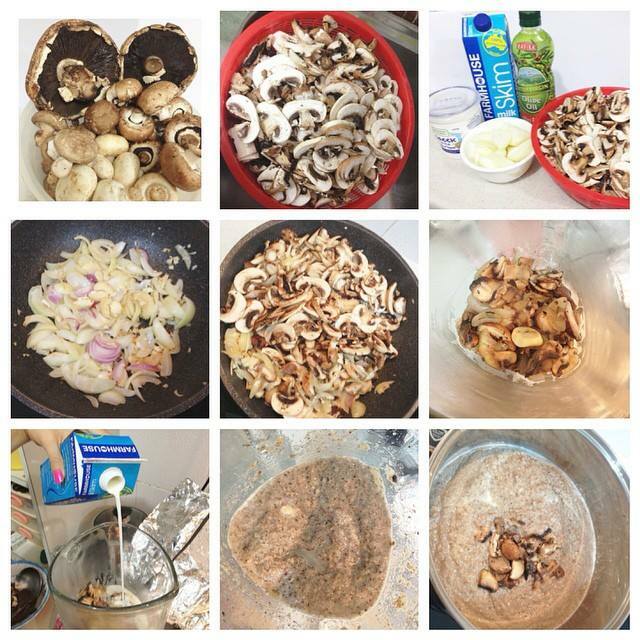 And I came across Limaran’s blog on her simple version of creamy mushroom soup, which I found easy to do and nutritious at the same time. This recipe is protein-loaded as it consist of yoghurt, cottage cheese and skim milk being the substitute of cream. Eliminate the use of cream as it is full of empty calories and fat. Moreover, this recipe requires little ingredients as those comparable online. Do you know that mushrooms have a long list of nutritional benefits? Mushrooms are an excellent source of B vitamins, such as riboflavin, niacin and pantothenic acid, an excellent source of the essential minerals, selenium, copper, phosphorus and potassium. Plus, it contains low fat and carbohydrate with the absence of sodium. Perfect food for people who are conscious about their weight. Mushrooms are known to reduce cardiovascular diseases by lowering blood pressure, cholesterol and also boosts the body immune system with anti-inflammatory and strong antioxidant properties. Read more on: Wikipedia (Mushrooms) and Health Benefits of Button Mushrooms. I did a tweak to the amount of ingredients used as I brought 2 big baskets of mushrooms and increase the amount of milk/cottage cheese and greek yoghurt whilst trying out the texture of the soup. This is why I love cooking as I am free to customize the end product taste to my own liking! Heh. Step 2: Chop assorted mushrooms into small pieces and mix them together. Step 3: Prepare all other ingredients including onions, garlic and parsley leaves. Step 4: Fry garlic, parsley and onions with a little bit of olive oil, until you can smell the fragrance. Note: Do not fry them till brown. Step 5: Add in all mushrooms and fry everything together. Step 6: Before blending the ingredients, pick out some mushrooms to be added into the soup after boiling for a different texture and chunk. Step 7: Portion by portion, place all ingredients into a blender and add in skim milk slowly. Step 8: Pour all the blended mixture together with the chunks of mushrooms into a pot and heat. Continue stirring till it boils and add in Greek Yoghurt and Cottage Cheese. Step 9: Add in few teaspoons of salt to season. 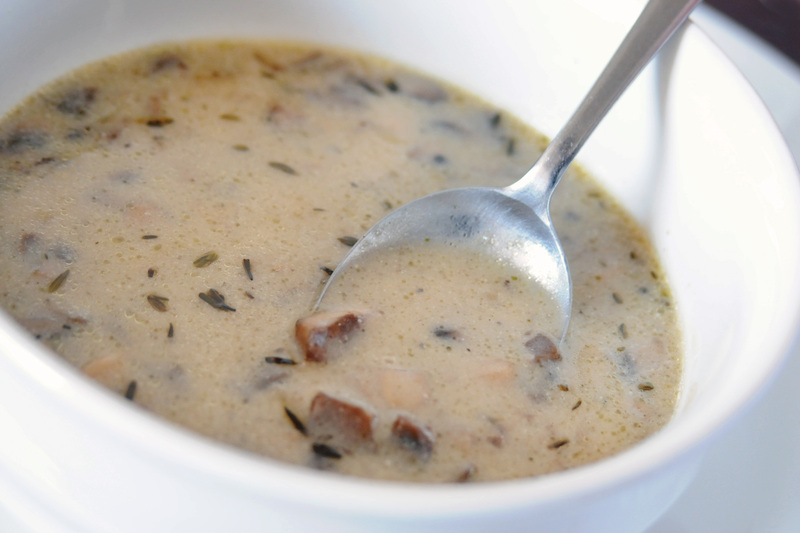 Keep stirring until everything else blends and your creamy mushroom soup is ready to serve! Topped it up with more parsley and black pepper for a more enhanced flavour. Slurps~ Simple, healthy and delicious! I will never go back to conventional mushroom can soup even though it is conveniently available, cheap and time-saving (preparation and cooking time). As, what I reap from that can soup is preservatives, sodium, fats and colouring. I would rather spend more money and time nourishing my body that has work so hard for me. Like what I mentioned on my previous post about 70/30 rule. Healthy food plays a crucial role in enhancing overall health and fitness. Way to go healthy eating! I love TARO balls! Fell deeply in love with taro and sweet potato balls during my first trip to九份, Taiwan. Renowned for their famous QQ balls! 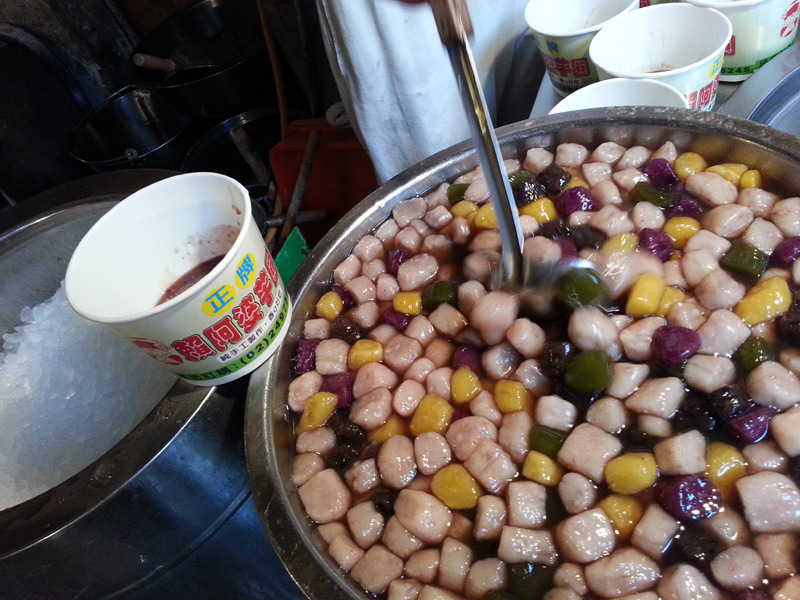 In Taiwan, they are basically served with red bean, cream milk, grass jelly and black pearls! 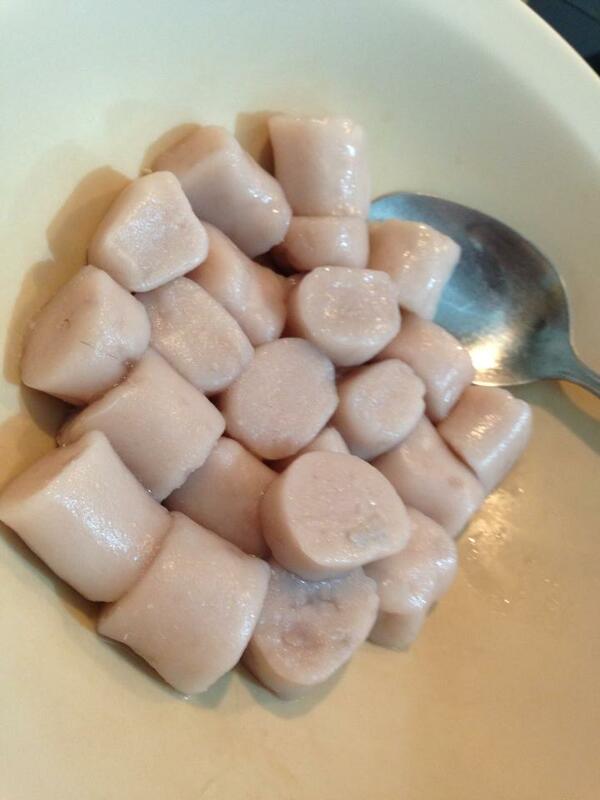 I decided doing some home-made taro balls as it is not cheap eating them outside with miser serving. I would love to see a mountain-ful of chewy taro balls. 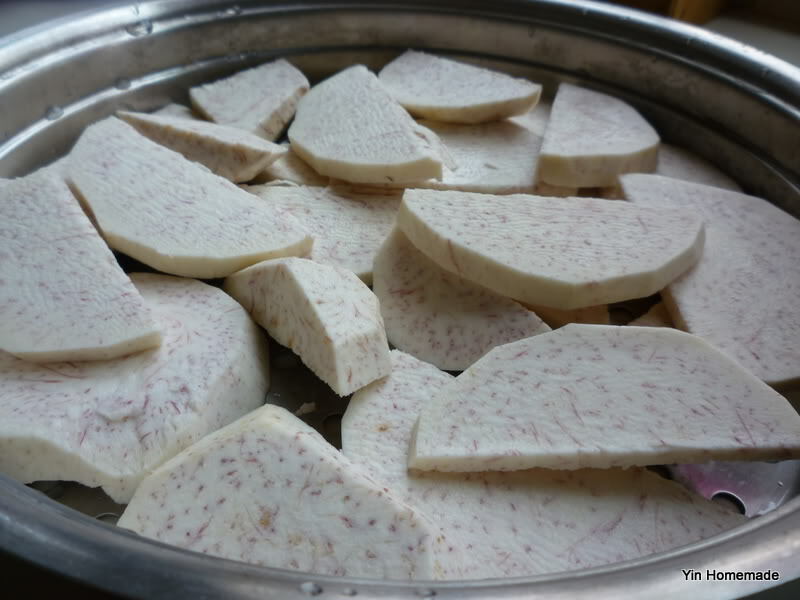 They are also known as yuyuan (芋圓) which is made with taro, or diguayuan (地瓜圓 or 蕃薯圓) which is sweet potato. Slice and cut taros into pieces and steam till soft (about 15 – 20 minutes). Test the steamed taro by using a fork if the taro breaks easily, proceed to next step. 3. Smashed taro and add in sugar. Do this while the yam is still hot for ease-sake; it’ll be easier to mash and mix with sugar while it’s warm. 4. Add sweet potato flour to the mix and (optionally) a bit of water. Dough should be mashed up evenly, feeling elastic and smooth. 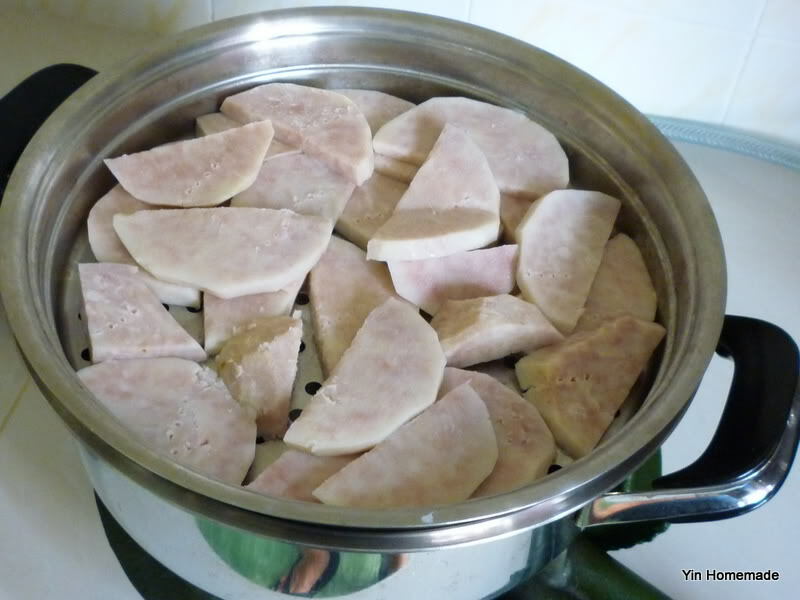 If the taro mixture seem dry, add more water (1 spoonful), otherwise if it is too wet add in more flour. 5. Continue mixing all the flour with the taro mixture and continue kneading it until mixture becomes dough-like. 6. After which, you may roll up and chop taro mixture into cubes (like what I did) or roll it up like an ah balling! The texture, regardless of shapes will taste the same if taro mixture is properly mixed and kneaded. 7. 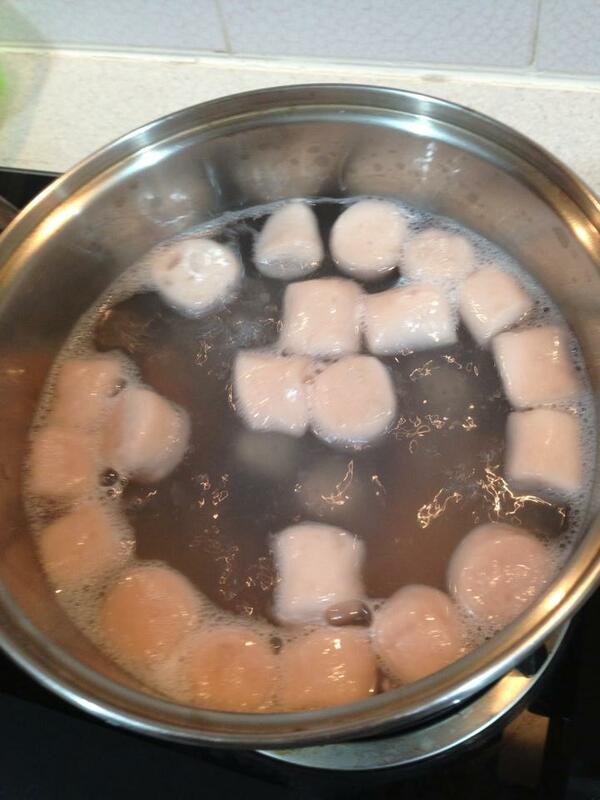 You may toss taro balls in cornstarch, before cooking to prevent them from sticking together. Do place them to a container to store if you are not cooking them right away, as to prolong the freshness of the taro balls. 9. 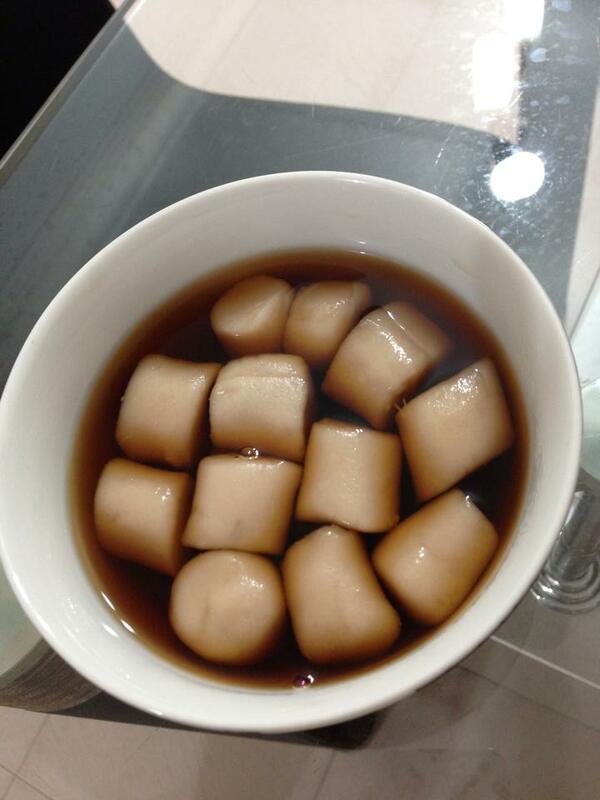 Toss the cooked balls into a bowl of iced water. 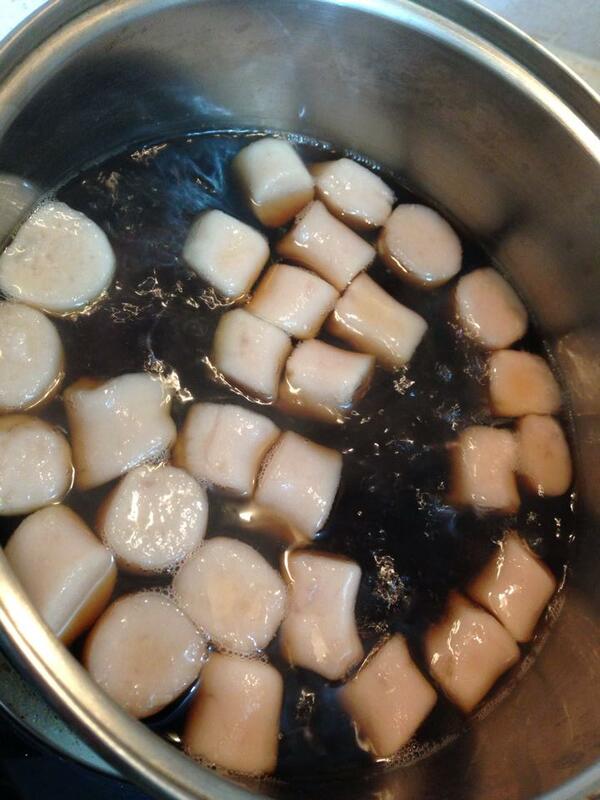 By doing this, taro balls will be cooled down quickly and taste more chewy = QQ texture. In this case, I cooked them with brown sugar (after Step 1-9)! 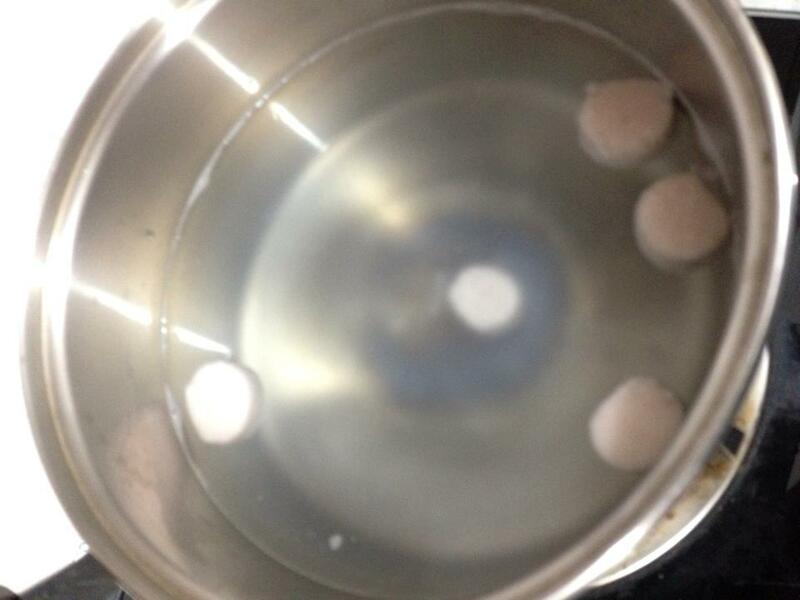 I prefer cooking uncooked taro balls in water and cooked them again with brown sugar. 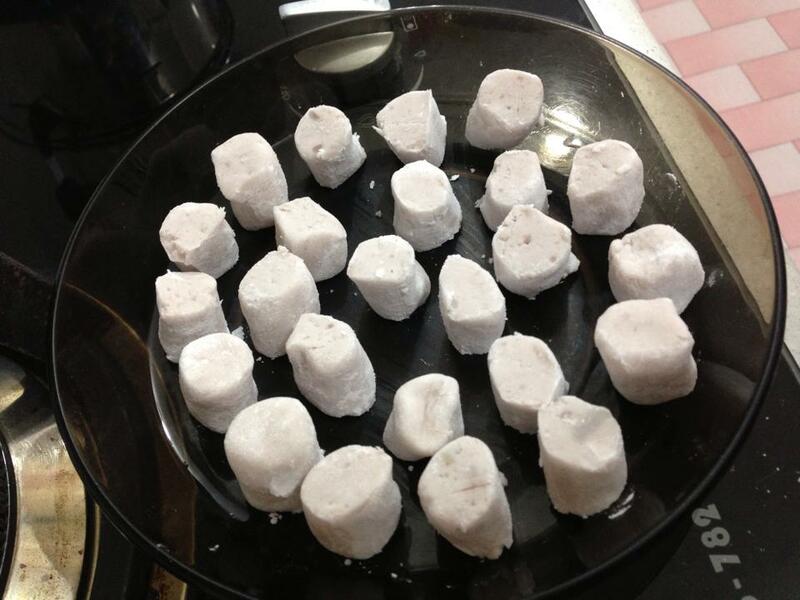 In this case, the taro balls preserve it’s chewiness and the base of the dessert will not have additional flour taste.